Valentine’s Day preparation is in full swing: boxes of cards on the shelves in department stores, countless bags of candy, and all those big-name diamond retailers competing for air time on TV. It might be the very reason many of us do not like Valentine’s Day. Gifts can feel forced, people can feel obligated to buy expensive dinners, or feel crunched for time in finding a personal card. Instead of dreading February 14th, I have an easy project that could replace those mass-produced cards and bring a bigger smile to your loved ones’ faces. 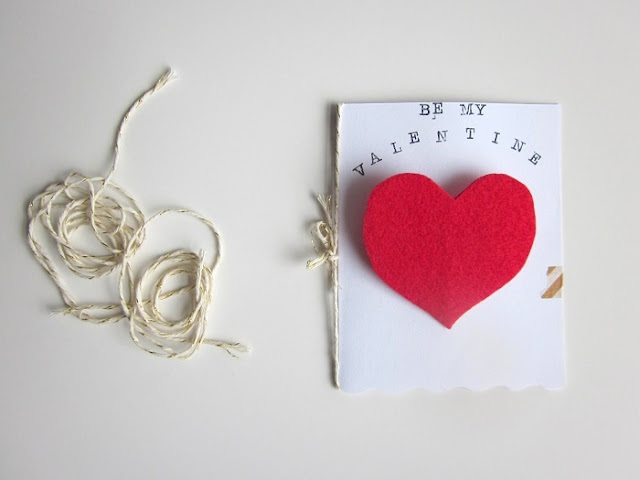 This DIY only takes a few minutes for each card, and is so customizable. I used my alphabet stamps, left over card stock, and one sheet of stiff felt. 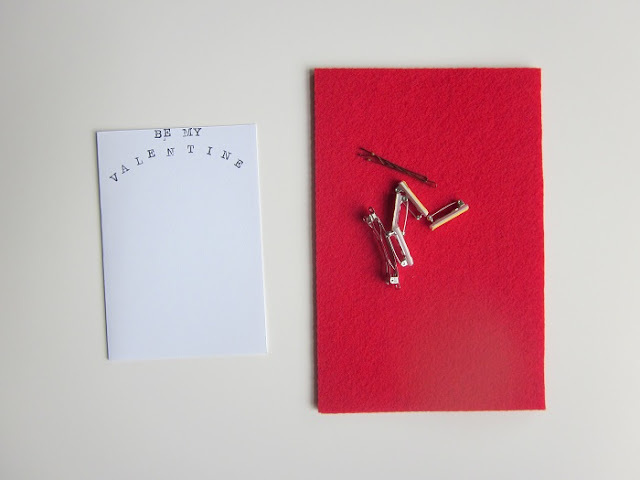 You’ll also need some sort of backing for your heart, like a pin or hair clip (or ring, or adhesive to make a sticker… there are many possibilities). I like to gather as many materials as possible from my own collection — take the paper from the recycle bin or use scrap fabric from another project — but admittedly I bought a pack of pins for these ones. You can use the pin to poke a hole in the card and enclose it around the paper. Stamp whatever message you prefer, and it’s ready to go! I spruced it up with some twine that came wrapped around a recent Etsy purchase, and closed it with washi tape—no need for an envelope. Wouldn’t this look so cute on an excited child’s dress shirt or in their hair? (Beware of sharp points, though). I made a brooch for myself, too. Don't spread yourself too thin, allow time for a little self-love, too! 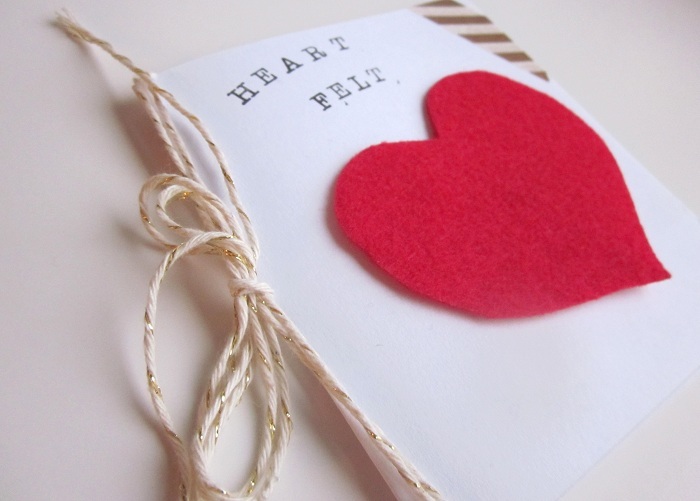 And my goal is to give a card to one person I might not normally reach out to. 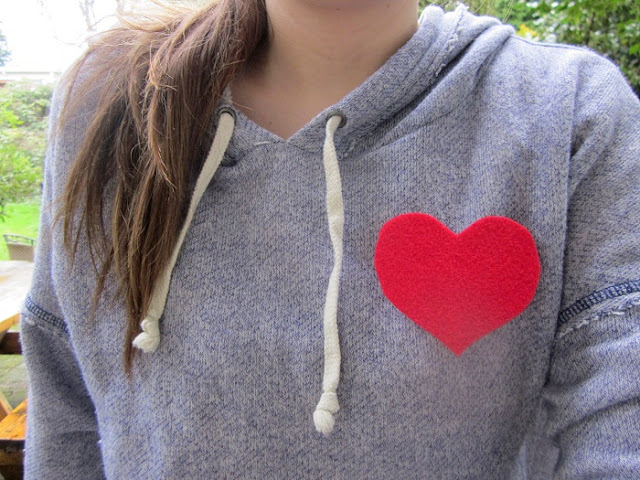 Why not wear your heart on your sleeve (or whatever)? What a cute idea! I love that you can give a card and have it be a gift too.